Bob started at CKUA in 1969 as a fresh-faced 19-year-old. As a student with the Northern Alberta Institute of Technology (NAIT,) he handled the weekend news. His first full-time gig was hosting the morning show, then called Shank of the Morning. After four years at CKUA, the young man took a 28-year-hiatus from radio. He spent those years as a television journalist and news anchor for CBC and CTV. He returned ‘home’ to CKUA as he says, in 2001, as morning host. Soon after, he created The Road Home, which has acquired a very loyal following over its years on the air. Bob’s varied experiences lend itself to true depth as a host. “All that I have learned as a journalist, music curator, visual artist, film maker, transcendental meditation teacher, student of nature, lover of animals, curious listener, poetry devotee.... all of it has been a preparation for The Road Home program,” he says. The Road Home offers a quiet cabin in the woods for listeners to enjoy; a place of refuge and discovery, rife with images that move the mind and the heart through readings, songs and personal ruminations on the country life. 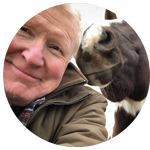 Host Bob Chelmick offers poetry, song and reflections on his world of dogs, horses, birds and other subjects for a gentle adventure on the road we all share.